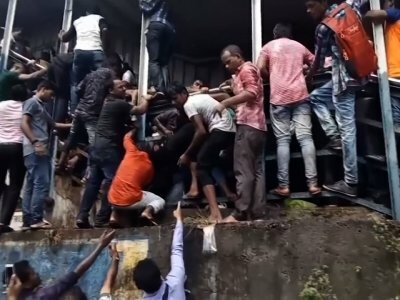 A stampede broke out on a crowded pedestrian bridge connecting two railway stations in Mumbai during the Friday morning rush, killing at least 22 people and injuring 32 others, Indian officials said. Police were investigating what caused the stampede on the bridge, which led some commuters to leap over the railing. Others were crushed or fell underfoot and were trampled. One rescuer told Indian broadcaster NDTV that the stampede trapped dozens in the narrow passage, forcing rescuers to break the railing to pull people out. Mumbai police official Gansham Patel said some falling concrete had hit part of the bridge railing, leading people to surge forward out of panic at the thought that the bridge was collapsing. 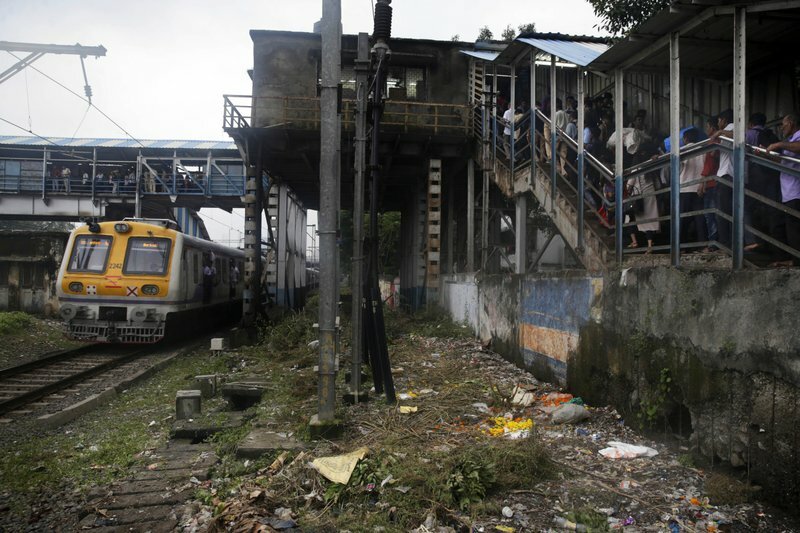 Commuters also often complain about hawkers selling their wares on the narrow overpass, which connects two commuter railway stations, Elphinstone and Parel. Heavy rains meant the bridge was even more crowded than usual, as some sought shelter from the downpour under the canopy covering the bridge, said lawmaker Shaina Nana Chudasama of the governing Bhartiya Janata Party. Hospitals were treating 32 injured people, including 19 women and 13 men. 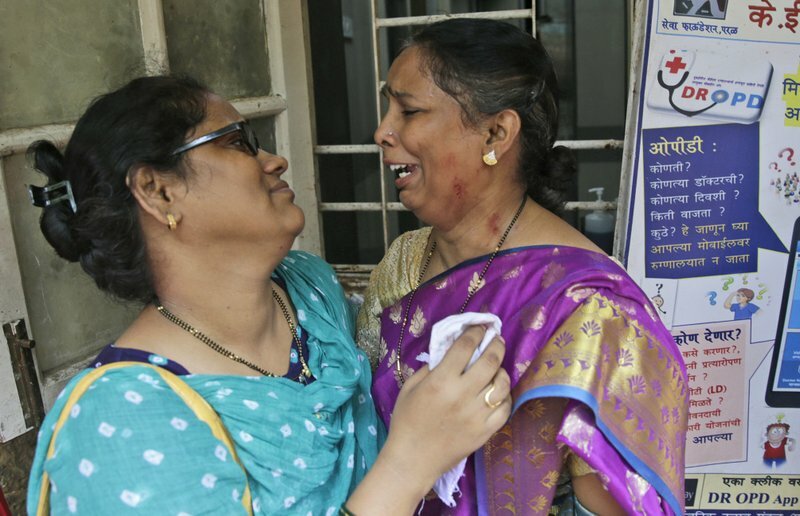 As Mumbai police appealed to citizens to donate blood to help the injured, Prime Minister Narendra Modi expressed his condolences to the families of those killed. “Prayers with those who are injured,” Modi tweeted. He complained that government rescuers did not respond quickly to alerts sent by phone. “Local people had pulled out most of the victims by the time the police and government rescuers arrived,” Thakkar told TV news channel ABP. Tabrez Mukadam, a relative of a day worker who died in the stampede, said such accidents happen too often in India. 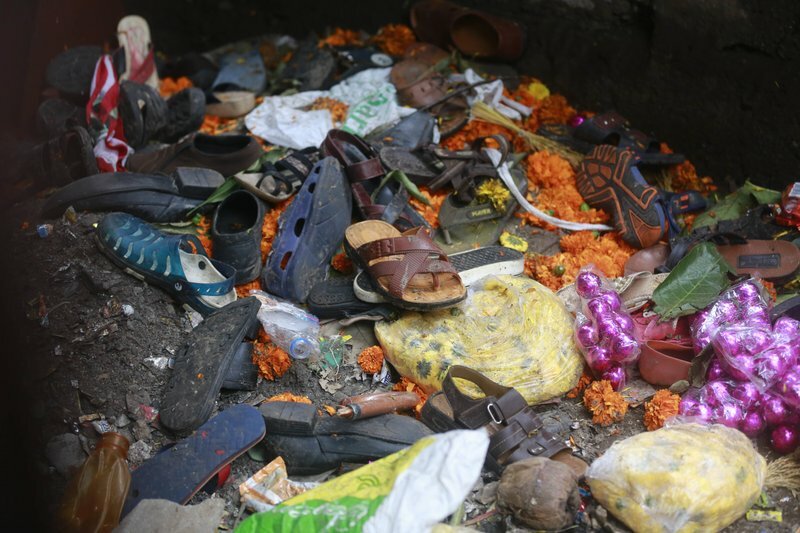 Separately in the southern city of Banglaore, two people were killed in another stampede by hundreds of people jostling to obtain coupons for free food offered by a local philanthropist, police said. The philanthropist has been detained for questioning. Deadly stampedes are fairly common in densely populated India, where many cities are unequipped to deal with large crowds gathering in small areas, with few safety or crowd control measures. Policemen stand guard at the pedestrian bridge where a stampede took place at the Elphinstone station, in Mumbai, India, Friday, Sept. 29, 2017. The stampede broke out on a crowded pedestrian bridge connecting two railway stations in Mumbai during the Friday morning rush, killing a number of people police said. 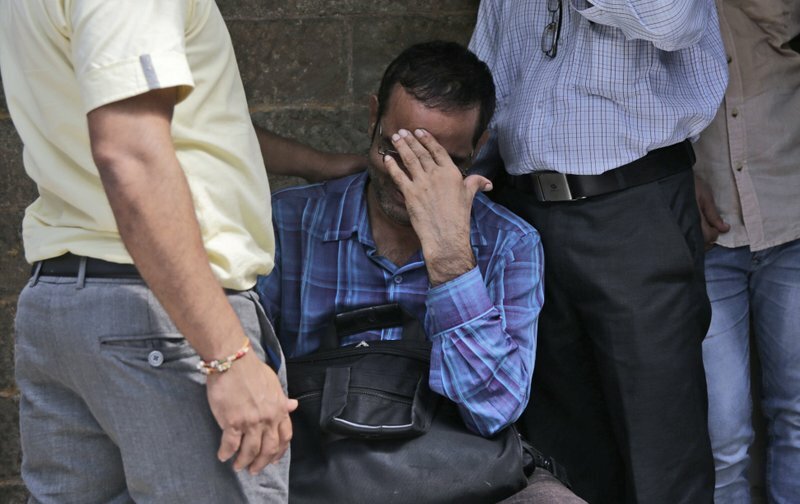 An unidentified survivor of a pedestrian bridge stampede mourns the death of his daughter who was with him at the Elphinstone station, in Mumbai, India, Friday, Sept. 29, 2017. The stampede broke out on a crowded pedestrian bridge connecting two railway stations in Mumbai during the Friday morning rush, killing a number of people police said. Friends mourn the death of their colleague’s daughter during a pedestrian bridge stampede incident at the local Elphinstone station, in Mumbai, India, Friday, Sept. 29, 2017. 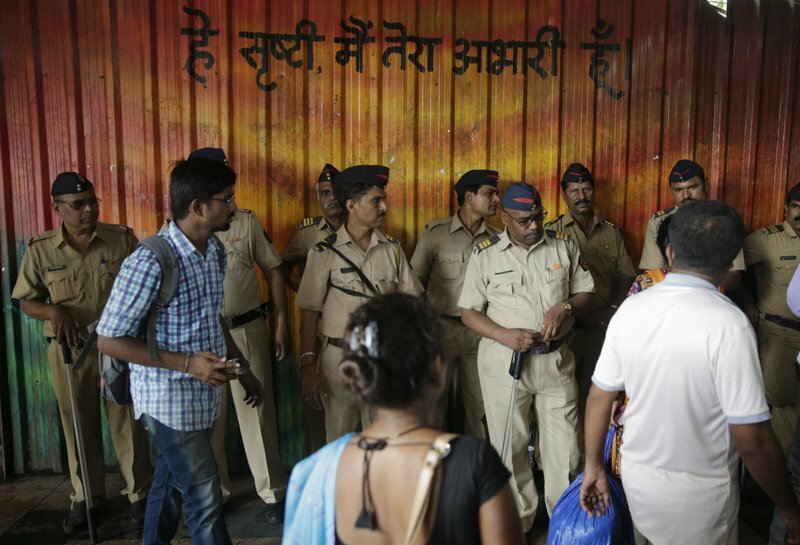 The stampede broke out on a crowded pedestrian bridge connecting two railway stations in Mumbai during the Friday morning rush, killing a number of people police said. An Indian man mourns outside a morgue for a relative killed in a pedestrian bridge stampede, in Mumbai, India, Friday, Sept. 29, 2017. 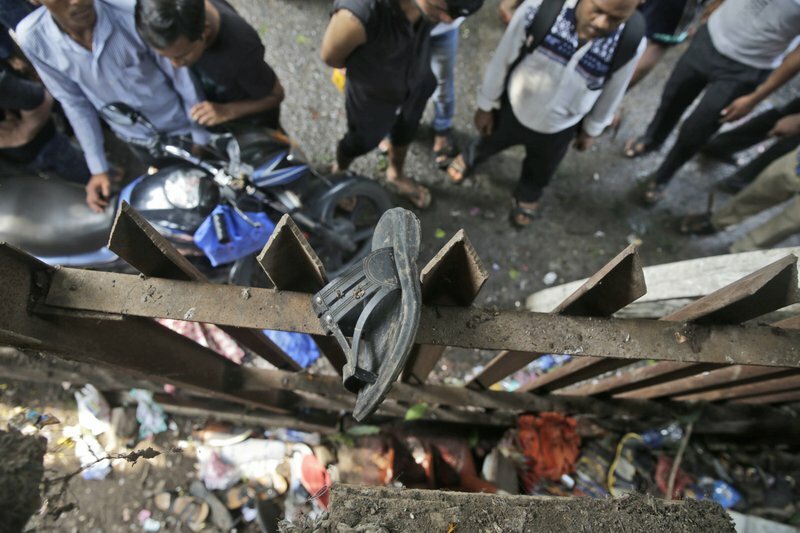 The stampede broke out on a crowded pedestrian bridge connecting two railway stations in Mumbai during the Friday morning rush, killing a number of people police said. 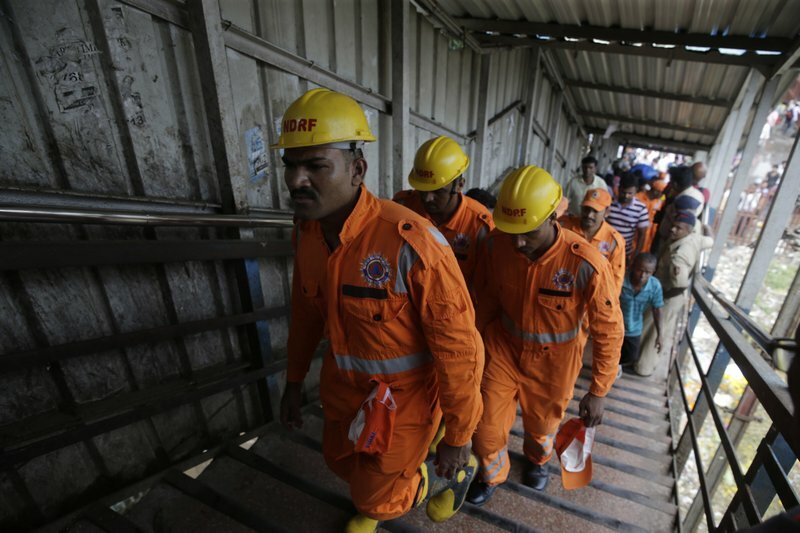 Members of the National Disaster Response Force team arrive at the pedestrian bridge where a stampede took place at the Elphinstone station, in Mumbai, India, Friday, Sept. 29, 2017. The stampede broke out on a crowded pedestrian bridge connecting two railway stations in Mumbai during the Friday morning rush, killing a number of people police said. 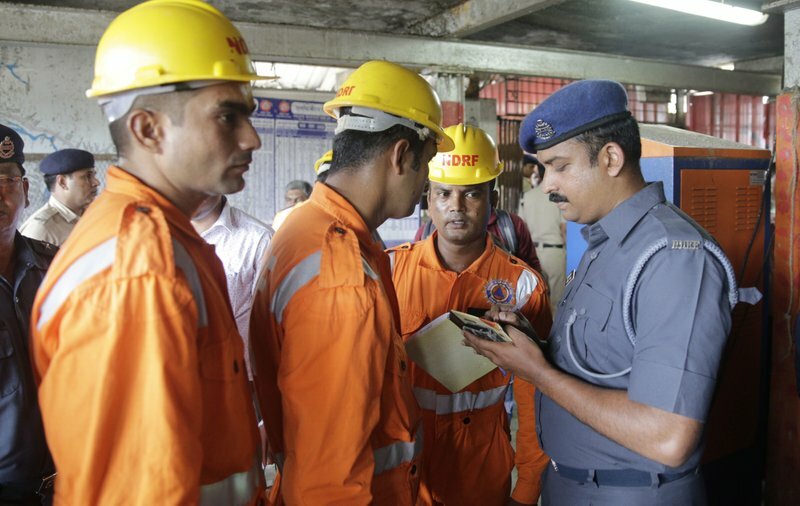 Members of the National Disaster Response Force team talk to a security officer at the pedestrian bridge where a stampede took place at the Elphinstone station, in Mumbai, India, Friday, Sept. 29, 2017. The stampede broke out on a crowded pedestrian bridge connecting two railway stations in Mumbai during the Friday morning rush, killing a number of people police said. 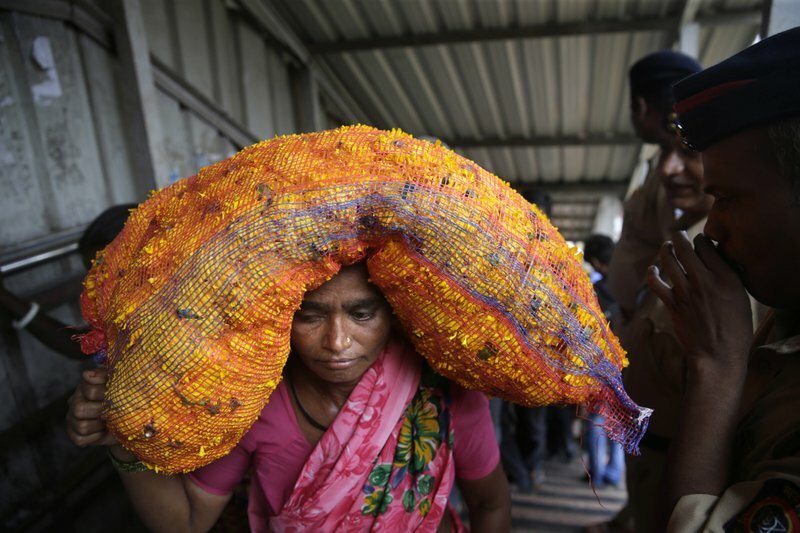 A woman carries a sack of flowers on her head as she walks across a pedestrian bridge where a stampede took place at the Elphinstone station, in Mumbai, India, Friday, Sept. 29, 2017. The stampede broke out on a crowded pedestrian bridge connecting two railway stations in Mumbai during the Friday morning rush, killing a number of people police said.